Established in 2006, GES works with original equipment manufacturers (OEMs) and end user customers in the semiconductor, solar, flat panel, and medical markets. GES provides high quality outsourced services supporting the critical areas of their clients’ core business operations: design engineering, manufacturing, field service engineering and training support. The company also tests & assembles equipment. 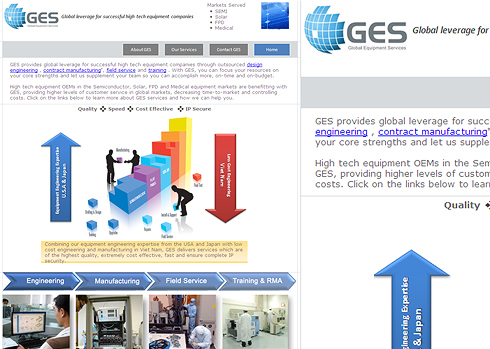 GES is a California-based company with operations in the USA, Japan, India and Vietnam. Thanks to its innovative and unique outsourcing services, GES has experienced rapid growth and has become a truly world-class corporation.